The Charcoal Grill and Rotisserie Restaurants serve up a delicious variety of All-American favorites (and some other countries too) all cooked over charcoal or wood for a one of a kind backyard barbecue taste and smell. Our dinner menu features freshly cut steaks, ribs, chops, burgers and chicken all made to your specifications. Try one of our wood-fired brick oven pizzas, definitely a break from the ordinary or eat a little healthier with one of our huge salads. If you still have room after dinner why not treat yourself to one of our sinful desserts. Meet the crew from work for Happy Hour in one of our Sports Bars. There are plenty of monitors so everyone can get a great view of all the action. Enjoy a wide selection of domestic and imported tap and bottled beers, premium liquors and fine wines. 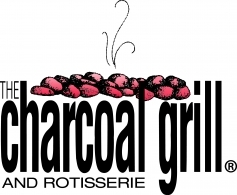 Since we opened our first location in 1993 the Charcoal Grill and Rotisserie has grown to 9 locations throughout S.E. Wisconsin. We have locations in Kenosha, Racine (2), Burlington, New Berlin, Grafton, Manitowoc, Appleton and Plover. Each has a unique personality all their own. Bring your friends and family to “Your Official Backyard Barbecue” for backyard barbecue tasting food and the best in casual dining all year round.